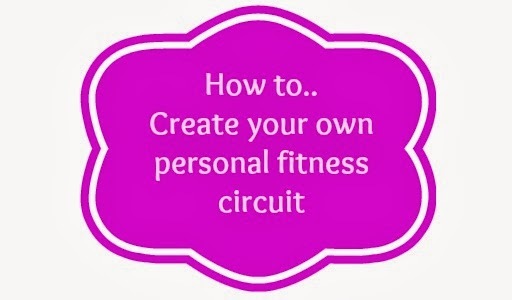 How to create your own at home circuit.. Circuit training is amazing, it can be time effective, great for burning calories, shaping your body and best of all it can be completely personal and tailored to your needs. I like many others save many circuits from Pinterest for my own personal inspiration but I absolutely love creating my own workouts to fit into my day and the area’s I really want to focus on. For most of us creating our own workout would appear intimidating but here’s a step by step guide to get you started and the best part is it’s far more simple and cost-effective than you may think. Chances are you have everything already. What you need depends entirely on the results you are after – Many workouts circuits can be enjoyed without any equipment and using your home wall, or stairs or even chairs. *I need to buy a yoga mat but right now I use a throw…It works just as well. I’ll be looking to add another kettlebell, a skipping rope and an exercise wheel to my collection but what I have right now allows me to achieve almost any move, even if I have to get a little creative. You can pick up these items from Tesco, TK Maxx, Ebay, Sports Direct, Amazon etc..
Learning how to complete a move correctly is extremely important to prevent injury and get the results you’re after, this is why I love fitness DVD’s. They provide visual instruction and you can pause and rewind as many times as you need; the wonderful world of YouTube is great if especially if it’s just one or two moves your after (and it’s free). When lifting weights don’t hesitate to stand in front of a mirror to check your form, slow and steady wins the race in this case. How long should I work out for? How long for each move? The answer is there’s no time limit – If you go for a high-intensity workout then ten minutes can be completely adequate or maybe you would prefer to enjoy stretching out your workout for over 30 minutes. I like to split my workout into mini circuits by focusing on two or 3 moves for each part, for example, 3 abdominal moves, followed by 3 lower body moves and then a short sharp cardio session. It’s really important to include moves you DON’T enjoy and moves you do enjoy; no one likes a burpee but it really does tone your whole body so it’s worth a little pain. Don’t ever be afraid to try something new; your body needs regular changes to keep it toning and changing by mixing up workouts on a regular basis this will keep your body and mind guessing. Do keep in mind that if your lifting at your limit you do risk injury with a high number of reps but there is a point when you do need to push through, remember to push your body NOT punish your body. For timing workouts, I use my mobile phone as a timer and a cardio application to calculate my calorie burn but I would rather underestimate my workout than overestimate. You have to ask your self ‘Was I really at my highest intensity level?’. *Enjoy the freedom of being able to workout in your front room in your pants! Tell me, do you work out at home? Have you ever created your own workout?